Plants grown at 68F day, 60 night temperatures lasted 36% longer compared to those grown at 86F day, 77F night temperatures. Fronds harvested from tissue cultured propagated cultivars generally last longer than those not from tissue culture. On average, larger size fronds tend to not last as long as smaller size ones harvested from the same cultivars. Most leatherleaf is dipped after harvest in various mixtures of water, mineral oil and surfactant to both clean and hopefully extend subsequent vaselife. Commercial products sold for this purpose include Hydroseal, Pixie Sparkle or Saf-T-Foliage. When vaselife is naturally two weeks or longer for non-treated fronds, these treatments add little value. However, vaselife can be significantly extend up to nearly 300% when dipped in these solutions at times of the year when non-treated fronds last less than two weeks. Fronds produced under high night temperature (77F) did not last as long as ones produced at 60F. High percentages of urea containing fertiliers should not be used with this species as decreased yield and quality are likely. Can be stored at 34-45F (3 days or less), 40-42 (more than 3 days). Best to provide high relative humidity for both wet and dry storage. 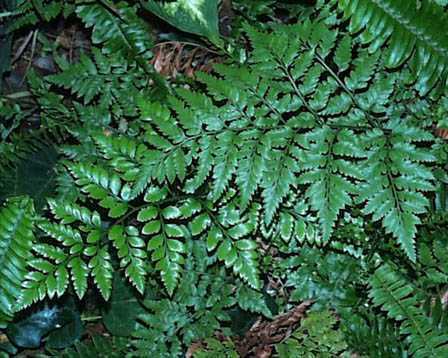 The specific epithet name is from the Greek “adianton” (unwettable) referring to the fronds’ ability to shed water. The most commonly used floral green, grown in Florida and shipped worldwide. For those Chain of Life Network Members wanting more detailed information about the florists’ greens industry, it is highly recommended that Robert Stamps’ article entitled Florists’ Botanicals (2001) be read. Most commercial production is located in Costa Rica and central Florida. Members of this family do not produce flowers as they reproduce by spores. Spores are contained in sori or “fruit dots” and appear as dark spots on the lower surface of mature leaves called fronds. In one experiment, Fujino et al. (1981) showed that vaselife was not increased by recutting the stems in air. However, recutting stems in air or under water is still recommended. Stamps and McColley (1997) showed that multiple preharvest treatments using the fungicide Chlorothalonil can reduce vaselife but not yield and therefore should not be repeatedly used.